The Twins, and probably every organization in baseball, need and want more pitching. Even with the “opener” concept starting to take root in the game, development of starting pitchers will always be a top priority for baseball executives and coaches. Today, we announce the Twins Daily Minor League Starting Pitcher of the Year. There were some good choices again in 2018. Here are the top five picks for the 2018 Minnesota Twins Minor League Starting Pitcher of the Year. Colina signed with the Twins in September of 2015. He pitched in the Dominican Summer League in 2016. Last year in Elizabethton, he was the Appalachian League Pitcher of the Year. While his walk total was high, Colina was often able to work out of situations with strikeouts. Colina is stocky and strong. While he isn’t tall, he uses has legs to drive the ball. He sits 93 to 94 mph, but he can hit 96 regularly. He’s got good secondary pitches as well. He spent the majority of the season in Cedar Rapids, where he started a no-hitter. He ended the season with a start for the Miracle and then was the winning pitcher in the Miracle’s championship game. Thorpe was added to the Twins 40-man roster last November. After missing two full seasons with Tommy John surgery (and mono), Thorpe showed enough in Ft. Myers to earn the roster spot. This year, he began in Chattanooga where he struggled early. But he started pitching well and was named to the Future Game where he represented the Twins and Australia. He took off from there, throwing more and more strikes and getting a lot of strikeouts. He ended the season with four starts in Rochester. Gonsalves was the Twins Daily Minor League Starting Pitcher of the Year in 2016 and 2017. He was the runner up to Jose Berrios in 2015. After being added to the 40-man roster last November, Gonsalves came to his second big league spring training. He struggled early and was sent to Chattanooga where he issued too many walks but dominated in four starts. He was promoted to Rochester where he went 9-3 with a 2.96 ERA. When you consider he has starts in which he gave up six runs in 1 2/3 innings, five runs in 2/3 inning, and nine earned runs in four innings, he was incredible in the rest of his innings. He followed the nine-run outing with a stretch of seven starts in which he gave up just two runs over 40 1/3 innings. In mid-August, the 24-year-old received the call to the big leagues. The Twins signed Graterol way back in late August of 2014. The Venezuelan right-hander pitched just 11 innings in the Dominican Summer League in 2015 before coming to the Twin Cities and having Tommy John surgery. He continued to rehab until early in the 2017 season when he returned to pitching, this time for the GCL Twins. He split 2018 between the GCL and Elizabethton. He began the 2018 season in extended spring training, though he got to Cedar Rapids before the end of April. With the Kernels, he went 3-2 with a 2.18 ERA in 41 1/3 innings (9 BB, 51 K) before being promoted to the Miracle shortly after the Midwest League All-Star Game. With the Miracle, he went 5-2 with a 3.12 ERA in 11 starts and 60 2/3 innings (19 BB, 56 K). Blessed with a fastball that sits in the upper 90s and frequently hits triple digits, Graterol also has the makings of a quality slider and changeup. The Twins used their 15th-round draft pick in the 2016 draft to select a tall, right-hander from Cal State-San Bernadino. He was an interesting draft story. That was the carrying story for Wells as he came into the 2018 season. This past offseason, Wells worked really hard at Performance Fitness for Athletes as well as greatly improved his diet. It was noticed, and it paid off. Since being drafted, he has lost about 50 pounds. The weight loss is part of Tyler Wells’ 2018 story, but at the end of the day, he is the choice for Twins Daily Starting Pitcher of the Year because of the numbers and because of the results, and frankly, because he is a really good pitcher. Wells made 16 starts for Ft. Myers to start the season and was named a Florida State League All Star. He went 8-4 with a 2.80 ERA and a 0.89 WHIP. In 86 2/3 innings, he walked 17 and struck out 82 batters. He was the Twins Daily Starting Pitcher of the Month in June. He was promoted to Chattanooga where he made six more starts and went 2-2 with a 1.65 ERA and a 1.13 WHIP. In 32 2/3 innings, he walked 14 but struck out 39 batters. Who knows? The Twins just may have got lucky in the 2016 15th round with Tyler Wells. Feel free to discuss below in the comments. Share your ballot! Interesting to see the top pitchers.The stats seem to indicate a big drop off from the top five to the honorable mentions.But what really jumps out is that Gonsalves was number two after two years as number one and another year at two.Gonsalves has a steady set of career MiLB baseball stats.So it raises the big question - why is he struggling in MLB.Not a little, but a lot.I can understand him needing to adjust to MLB, but he has looked awful. I remember Berrios did his first year too.What needs to be done for the transition.Is Gonsalves a AAAA pitcher? And then the question goes to Wells.When does he get his shot?Will he be able to move in to the rotation with more success than Gonsalves?Gonsalves ERA is 9.39 which would be the worst on the team without the leadership of Belisle and his 10.45. I am just concerned with how we get minor league pitchers to be MLB pitchers.I admit that the stats on Rookie starting pitchers is pretty poor, but Tampa Bay has Ryan Yarbrough https://www.baseball...yarbrry01.shtml and the Angels have Jaimie Barria https://www.baseball...barrija01.shtml who are doing well in that role. Nice. Love reading those backstories. I'm happy for Wells. I remember Bromberg; seem to recall at least one season (maybe dominating younger players?) where he put up some insane stats. I think Wells has a much better chance of succeeding, though. I would imagine he might get an invite next spring, but wouldn't really be on the radar for another year? Unless he gets a random chance on a make-up doubleheader or something and dominates. Colina is another intriguing guy prospect-wise, and Over was coming on strong before he got hurt, if I don't misremember. Thanks for the write up! Where does everything think the top five will start next season? - Colina will most likely start in Fort Myers since he only had 1 start there. - Thorpe will most likely start at Rochester after finishing there this season. - Gonsalves is a tough one. Will there be room in the Twins rotation right out of spring training? Will they send him to Rochester since he has struggled and they want him to get off to a good start next season? - Graterol - My guess is he makes ~ 5 starts in Fort Myers next season and if he's doing well moves up to AA and potentially AAA if he continues to dominate. - Wells will probably start in AA and hopefully move up to AAA before midseason. Very deserving of this! What is the likelihood Wells gets a spring training invite? He’s 24 now so I think he should be moved up a bit faster and tested. God knows the Twins could use a good arm. I’ve said it before and I’ll say it again. Tyler Wells will be the Twins Corey Kluber! Gonsalves hasn't shown me anything. Soft slop that might bewilder AAA batters doesn't fool major leaguers. He reminds me of Tommy Milone. If his control isn't perfect or the ump isn't giving him the corners he's going to get clobbered when he has to throw the ball over the plate. I'm discouraged that the Twins are so high on him. What a great year for Wells.Really hope he can continue pitching like this as he moves up. What was shocking to me is that three of you did not include Lewis Thorpe in your Top 5.Curious why?When I look at this group, I believe he has the best chance of joining the Twins at some time next year AND being successful.I believe Graterol has the highest ceiling of anyone in the minors, but don't expect him being ready to join the Twins in 2019.Hope like hell he will, but its too much of a long shot. Should be fun following the career of Colina the next couple years.Stocky and strong, would the word 'bulldog' be a good description of him and his pitching style? This is a pretty exciting list of pitching prospects for sure. 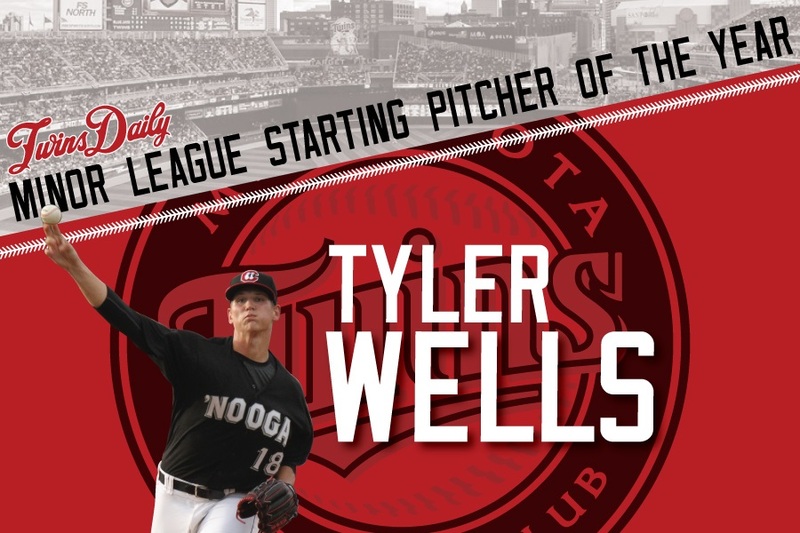 Tyler Wells is certainly deserving of this, and I don’t see why his success can’t be replicated even at the Big League level, unlike Gonsalves Wells has excellent command/control and has an above average pitching arsenal. Plus Wells seems to have a Jose Berrios like work ethic and doesn’t seem to take his playing career for granted. I guess I am a little surprised Blayne Enlow wasn’t mentioned. Now I get his strike outs were on the low side for what we expected this year but over all (especially near the end of the season) Enlow met or exceeded our expectations. Colina is an intriguing prospect, he seems to have solid stuff but I think he’ll go as far as his control/command takes him. While reading initially j was perturbed at Thorpe at Thorpe in the #4 spot. Really? Than j had to remember just how good Gonsalves was this season...again. Yes, he had a couple clunkers and his BB was unusually high. But he was, formthem most part, dominate once yet again. We can't let a few poor September starts ruin our opinion of him. It's a long season, it's his debut, his track record has always been to struggle a bit promotion and then make adjustments. Makes me feel good to realize Wells could pitch as well, or better, next season and slide down multiple spots with Thorpe and Graterol jot on his heels. Very good chance we see both Wells and Thorpe next year, with Graterol hopefully getting at least a half season at Chattanooga. Why is Kluber a comp for Wells? Kluber "came out of nowhere" but thats because he wasnt very good in the Minors. He struck guys out but credit goes to CLE because they kept promoting him despite his less than steller numbers. Wells is forcing people to take notice through his MiLB dominance. I expected him to struggle at AA and it looks like I was wrong. If he starts out hot and keeps the walks down he could find his way on the Twins roster. Agree!Perhaps the takeaway here is to look at our prospects' walk rates.Look at Gonzales 4.8BB/9 rate in the minors. He obviously never overcame these inherent problems, as indicated by his putrid performance since his callup.What does this say about Colina in A Ball?Don't know where the cutoff should be, but using the BB criteria, Ober looks the superior prospect. The Twins have failed to develop a home grown ace since maybe Viola, despite having some top draft choices.Wish the Twins could figure this out, but in the meantime, no one on this list looks ready to change this void.If the Twins are going to surmount this glaring omission, they will have to put together a nice package of minor leaguers to secure a #1 in trade or be able to win a FA bidding contest with the big boys. After this year, I remain a deep sceptic in this organization's ability to develop true difference makers, especially in the pitching department. Ok fair point. Let me amend. By that I meant that he wasn’t expected to be a prospect and ended up being an extremely good dominant MLB pitcher. I didn’t mean it as a direct comparison stat wise. Because Wells numbers in his career are far better than Klubers and 99% of all minor leaguers frankly. From what I’ve seen his minor numbers are up there in the top 10 of all guys drafted in the last 4 years. (Grain of salt alert as I haven’t looked THAT thoroughly, just surface). Poppin is quitely climbing the minor league ladder quickly. He started lsst year in Cedar Rapids and is now in AA. What does his scouting report say? Tommy Glavine threw slop all the way to the Hall of Fame. Belisle is the morale booster here. I am sure that the Twins have great plans of bringing some of these guys up in the 2020's. Next season Tyler Wells will be 24 years old.If, as someone suggests, he starts in AA and then gets a whiff of AAA late in the season, then do the same the following season, AAA with late MLB call up, he will not make his real full season debut with the big league team until he is 26. Players of his potential should be entering their 2nd or 3rd year of major league baseball by the time they are 26.I get there may be some reasons they have held him back, such as his weight and conditioning, but a rebuilding team needs these prospects up to the major leagues. I should have noted that I asked voters to vote for or rank their top 5 2018 performers. Well, Graterol and Gonsalves appeared on all six 'ballots' so there were only two more spots. If I had asked for people to vote for up to 8 pitchers, obviously there would have been more "receiving votes." What does Gonsalves need to do? Throw strikes. He's got the pitches and enough stuff and moxie and stuff to big OK, but as we've seen, without command (and really even control), it can't work against big leaguers. The Twins need to figure out over the next 12ish months to see what they may have in Gonsalves, Littell, De Jong, Romero, and then next year Thorpe enters the equation too. Wells could force his way into the conversation in 2019. Colina - Definitely Ft. Myers. Gonsalves - Definitely Rochester. Command is the issue. I can't imagine that even if he works 20+ innings without a walk in spring training, they're going to want him to prove it for a bit in AAA. Graterol - Probably Ft. Myers, some chance he could start in AA. More regarding Gonsalves: If he had come up and struggled mid-season, he could have been sent down with the list of things to work on. The minor league seasons are over, so he's just go to keep working in the big leagues and in the bullpen. Now he's got the offseason to make adjustments and two more options to make adjustments (obviously the hope is that he doesn't need them). Clearly some adjustments are needed, but he'll put in the work. So the idea of giving up on him at this point is just kind of crazy to me (not saying you're doing that, just others are). Next season Tyler Wells will be 24 years old. If, as someone suggests, he starts in AA and then gets a whiff of AAA late in the season, then do the same the following season, AAA with late MLB call up, he will not make his real full season debut with the big league team until he is 26. Players of his potential should be entering their 2nd or 3rd year of major league baseball by the time they are 26. I get there may be some reasons they have held him back, such as his weight and conditioning, but a rebuilding team needs these prospects up to the major leagues. People worry so much about age and level and age to reach the big leagues... How about we worry more about them just being ready when they get there, or soon after? That's more important. College guys, maybe other than the first few still take 3-4 years to get to the big leagues, and that's OK. Wells is from a D2 school. Taking a little longer to get to the big leagues can be a good thing. He may have been more raw when signed, needed time to develop a 3rd or 4th pitch, etc. If that means he gets to the big leagues at 26, oh well. I haven't seen a ton of him, a start in Cedar Rapids and a few spring training appearances. But what I saw was a guy with a fastball 92-93 (which is plenty) and the changeup/curveball combo is solid. What I've seen is a want to be aggressive and a willingness and ability to adjust quickly. I Really like how Wells attacks hitters.That no fear mentality seems likely to lead to success at higher levels.It is like he is daring hitters to try to hit his pitches.Really thought he pitched about as well as possible this year.If he can keep it up and I believe he will then he should get his big league opportunity next year. I thought Colina was solid but unspectacular last year.At the end of this year I felt he really turned his game up a notch.Hoping he can Mejia like in the near future. Always have been high on Brusdar but was hoping more younger pitchers would be making some noise. I still think pitching is a weakness in our system.Way to many number 5 starter types and not enough 2's and 3's potential.Still I like our system and am hopeful that if just a couple of these guys work we can be competitive down the road. When you talk about hte "health" issue, shouldn't that be an argument to get him up to the majors as fast as you can?Every inning that he pitches in the minors is just increasing the probability he injures his arm before he ever reaches the major leagues. The Twins, as a rebuilding team, have needed to commit to developing players at the major league level and htye just seem to refuse, preferring to pretend their minor league system develops the players adequately (which has been proven over and over not the case) and playing non-prospect mediocrities instead. I get that the team believed they could compete this season but that shows that they had delusional thoughts based on a blip season of 2017.Instead, they should have committed to the young prospects and sorted them out.Find out if a guy like Romero or Gonsalves, or even Wells, can pitch at the major league level.After they moved through their prospects, then bringing in startes like Odorizzi and Lynn, or the veteran relievers like Reed and Duke to fill in were required. Sounds good to me.I'd think that's a pretty good guestimate. When you talk about hte "health" issue, shouldn't that be an argument to get him up to the majors as fast as you can? Every inning that he pitches in the minors is just increasing the probability he injures his arm before he ever reaches the major leagues. I get that the team believed they could compete this season but that shows that they had delusional thoughts based on a blip season of 2017. Instead, they should have committed to the young prospects and sorted them out. Find out if a guy like Romero or Gonsalves, or even Wells, can pitch at the major league level. After they moved through their prospects, then bringing in startes like Odorizzi and Lynn, or the veteran relievers like Reed and Duke to fill in were required. What I mean is as long as he stays healthy I believe he’ll finish next year in Minnesota. The only issue to derail Wells is injury IMO. That’s what I mean.